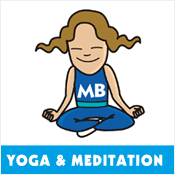 The Moving Bodies Yoga and Meditation Program will offer children an opportunity to learn about yoga and meditation incorporating simple breathing techniques they can use at home or at school. This empowers children and teaches them about their brain and how their mind works. Each week, children learn how to breathe with focus and how their breath can assist them to find calm. Deep breaths are used to bring more oxygen into the brain allowing for higher sensory processing to focus, concentrate, interact and learn more easily, at home or at school. Our teachers are all part of Clear Minded for Life – a team that have a variety of backgrounds including; corporate, teaching, law, natural therapies, performing arts, sciences and yoga. They each have an up to date awareness of the latest information on neuroscience, quantum physics and the way in which our thoughts affect our realities. Each teacher has an understanding and affinity towards children, they have also been engaged in their own self-development practice and continue to learn about the science of the brain. All our teachers are specially trained and regularly attend courses covering updated information to ensure they are aware of the latest knowledge around neurogenetics and neuroscience.